"Milky Way excellence, as always"
COMMENTS: Beautiful. Easy to release. Milky Way! COMMENTS: This mold is durable and easy to use. The soap pops right out and the detail is fantastic! Love it and am planning on getting another. "Used in melt & pour"
COMMENTS: I used this with melt and pour. I did multiple shades of green as well as some shimmery colors. Came out so beautiful. Very easy to unmold. 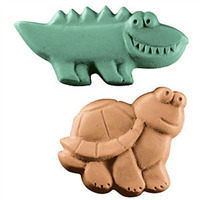 COMMENTS: Easy to use, and the kids love the turtles. COMMENTS: Gorgeous design. When finished the ripples of water can be seen. This makes 3 full size bars. Washing is warm water. Unmolding is easy. After setting, put in freezer for a few minutes and pop it out. This is one of the prettiest molds we have. Everyone wants these bars. COMMENTS: I love this mold. 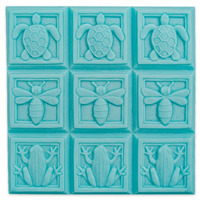 This particular turtle looks more like a sea turtle than some of the other turtle molds, and it is super easy to use. The detail was stunning and made me feel like an expert! COMMENTS: The only problem I have with this mold is...I only bought one!!!! Posted the soaps on my facebook and everybody wanted them, but I only had the 3 soaps. Buying 3 more of these molds. They truly are adorable!!! 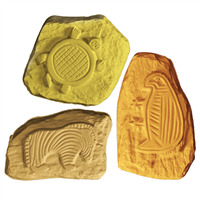 "Perfect for the beach crowd"
COMMENTS: Living on the coast, I am always asked for sea life soaps. 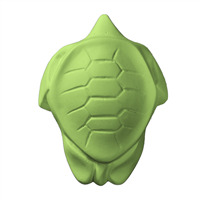 This sea turtle is perfect and every soap I put in the shop sold the first 2 days. A big hit! "What is this mold made of? What are the measurements of each soap?"